Pallbearers carry a casket from Rodef Shalom Congregation following the funeral for Tree of Life Congregation mass shooting victims Cecil Rosenthal and David Rosenthal. People leave Rodef Shalom Congregation after a funeral for Tree of Life Congregation mass shooting victims Cecil Rosenthal and David Rosenthal Tuesday in Pittsburgh, Pa.
A large crowd of Jewish and non-Jewish mourners gathered Tuesday under a vaulted white ceiling, tall chandeliers and stained glass windows inside Pittsburgh's Rodef Shalom to honor Cecil and David Rosenthal. At 59 and 54, the brothers were two of the youngest victims and are among the first of the 11 victims of the shooting at Tree of Life synagogue to be laid to rest. The brothers' wooden coffins sat head-to-head at the front of the temple as family remembered them as social, thoughtful men who were deeply involved in their congregation. Cecil's brother-in-law Michael Hirt said he could have been the mayor of Squirrel Hill if he didn't have an intellectual disability. He knew everyone and everything in town, including the gossip — deaths, marriages, divorces. Cecil's sister Diane said he loved a party and would have loved being on TV. David was remembered as a hard worker who was fanatical about cleaning. His family said he loved wearing police-style sunglasses and carrying around a police scanner. Michael said the brothers, affectionately known in the community as "the boys" never bore ill will toward anyone and will be missed. 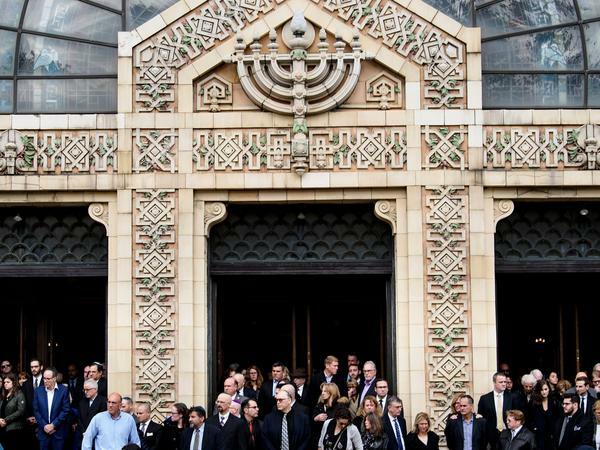 For many in Pittsburgh's Jewish community, Tuesday's funeral services start the formal period of mourning the victims — a process carefully guided by Jewish tradition. A separate service was held Tuesday for Dr. Jerry Rabinowitz, 66, a physician who also was killed on Saturday. Services for the rest of the victims will be held in coming days. Attendees spoke about Cecil and David with similar affection. One man, describing their place in the community, referred to the pair fondly as "the boys." People say they were fixtures; inextricable from Squirrel Hill's — and Pittsburgh's — Jewish circles. Among the faces at Rodef Shalom were Dan Frankel, the Democratic state Representative who lives in and represents Squirrel Hill. He's Jewish, and has been to a lot of weddings and bar mitzvahs at Tree of Life over the years. People were somber, dressed in dark clothes, but it's also easy to see that this is a close, friendly community that has been suddenly thrown into a strange tragedy. "I didn't know anybody that didn't know them. 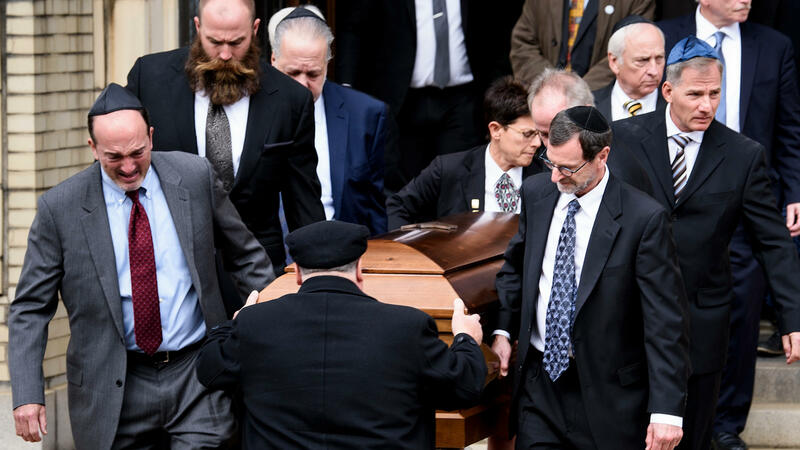 And they had a smile and a hug or a wave for everybody," said Sharon Ryave Brody, owner of the Ralph Schugar Chapel, a funeral home that serves mostly Jewish families in Pittsburgh. Ryave Brody deals with death every day, but this isn't normal. "We don't deal with a tragedy like this every day, thank God, but it's our duty, and it's an honor to be called by my community to be of service," she said. "So we do whatever we need to do to help everybody get through this." Rabbi Chuck Diamond, who once led the congregation at Tree of Life, said rabbis have been going to the morgue to be with the bodies in the days since the shooting. "We're not supposed to leave the body alone, and we have people that come them and guard them and be with them, and while they're there they pray, they say sing psalms," he said. "So it's just a feeling that somebody shouldn't pass from this world by themselves." Diamond said a ritual washing of the body is also part of the Jewish tradition to prepare for burial. "That's what we call the great mitzvah, the great commandment, the great 'good thing' that we do," Diamond said. "It's a very difficult thing, too." A burial traditionally takes place quickly in Judaism, ideally within a day or two, followed by a week of intense mourning. "There's a real desire to return to a sense of routine or normalcy," said Rabbi Aaron Bisno, the senior rabbi at Rodef Shalom. 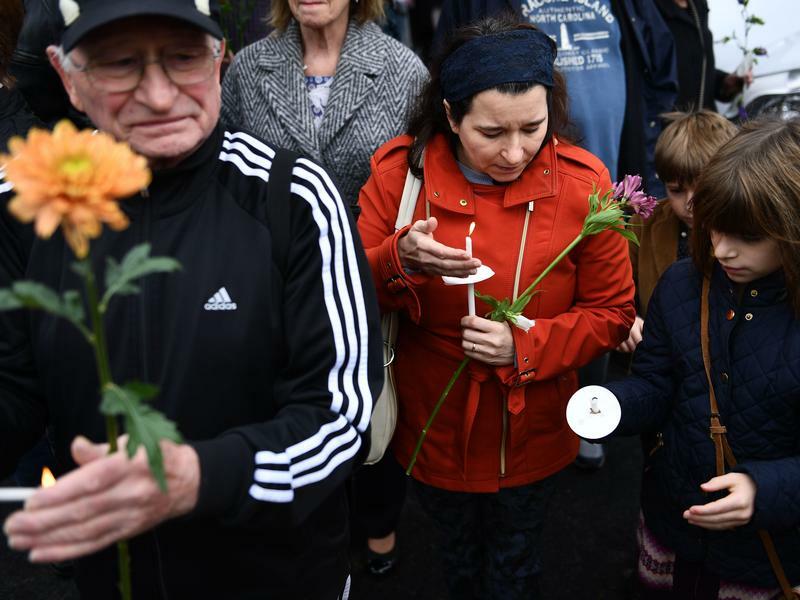 The ceremonies are an important part of the grieving process, said Rabbi Keren Gorban, of Temple Sinai in Pittsburgh. "The physicality of a funeral and a burial is what makes it real, and so Jewish tradition is also very insistent on a burial happening," Gorban said. "The family is there when it happens, and friends and family help fill in the grave. And that's actually been some of the most powerful moments in funerals for most of the families that I've worked with over the years — actually putting the earth in the grave." The timeline has been pushed back slightly because of the criminal investigation surrounding the shooting, but the process will begin Tuesday for the Rosenthals and their loved ones. The funeral director says there will be heavy security, and she's expecting an enormous crowd. One of the people who will be there is Marcia Urum Kramer, who knew the brothers since they were children. "And they were just — just so good ... always with a smile and caring," she said in an interview with NPR member station WESA. "Cecil and David have a special place in my heart." During his time leading Tree of Life, Diamond said the two were always there — one out front, greeting everyone who came to worship. "There's no question in my mind he was sitting in the back of the sanctuary, the chapel, at the time, greeting people at the time the gunman came in," Diamond said. 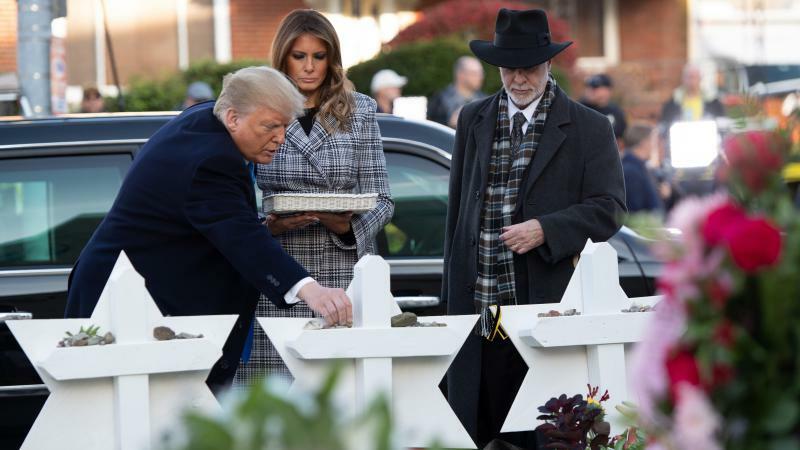 Services for the rest of the victims are being planned in the coming days, and Jewish leaders say there will be many months of mourning in Pittsburgh. Copyright 2018 WITF. To see more, visit WITF. Services for the victims of the mass shooting of the Tree of Life synagogue in Pittsburgh begin today, and that includes a service for two brothers. 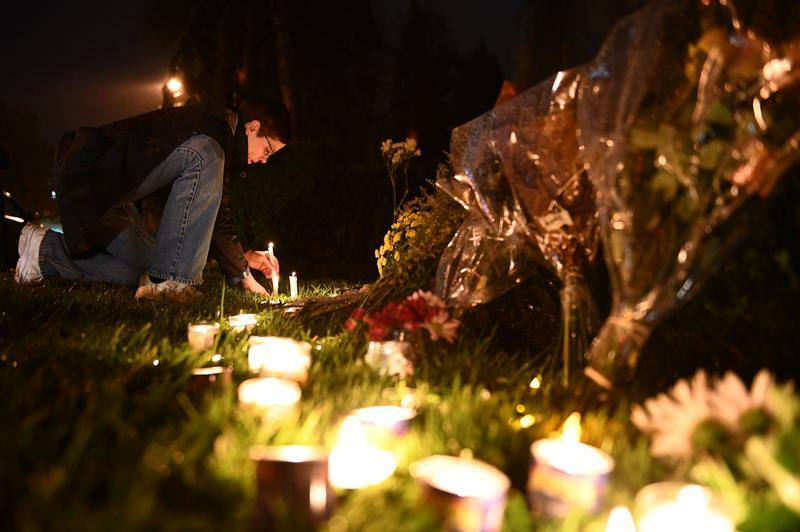 For many in Pittsburgh's Jewish community, the event will begin the formal period of mourning for victims of this shooting. As NPR's Sarah McCammon reports, it's a process that's carefully guided by Jewish tradition. SARAH MCCAMMON, BYLINE: The two brothers who will be laid to rest, Cecil and David Rosenthal, were in their 50s - the two youngest victims. People who knew them say the brothers had intellectual disabilities and that they were well-loved by their congregation in one of Pittsburgh's Jewish neighborhoods. SHARON RYAVE BRODY: I think everybody in Squirrel Hill knew them. MCCAMMON: Sharon Ryave Brody owns the Ralph's Schugar Chapel, a funeral home that serves mostly Jewish families in Pittsburgh. RYAVE BRODY: I don't know anybody that didn't know them, and they had a smile and a hug or a wave for everybody. MCCAMMON: Ryave Brody's phone has been constantly ringing in the wake of the shooting that killed the Rosenthal brothers. She deals with death every day, but this isn't normal. RYAVE BRODY: We don't deal with a tragedy like this every day - thank God - but it's our duty. And it's an honor to be called by my community to be of service. So we do whatever we need to do to help everybody get through this. MCCAMMON: Rabbi Chuck Diamond, who once led the congregation at Tree of Life, says rabbis have been going to the morgue to be with the bodies in the days since the shooting. CHUCK DIAMOND: So we're not supposed to leave the body alone, and we have people who come and guard them and be with them. And while they're there, they pray. They say psalms. And so it's just - somebody shouldn't pass from this world by themselves. And it's an honor. It's an honor for everybody who's involved in it. MCCAMMON: Diamond says a ritual washing of the body is also part of the Jewish tradition to prepare for burial. DIAMOND: And that's what we call a great mitzvah, a great commandment, the great good thing that we do. It's a very difficult thing, too. MCCAMMON: A burial traditionally takes place quickly in Judaism, ideally within a day or two. That timeline has been pushed back slightly because of the criminal investigation surrounding the shooting. AARON BISNO: There's a real desire to return to a sense of routine and normalcy. MCCAMMON: Rabbi Aaron Bisno is the senior rabbi at Congregation Rodef Shalom, which is hosting the Rosenthals' funeral today. He explains the thinking behind a quick burial, which is traditionally followed by a week of intense mourning. BISNO: Even as that won't be immediate, we want to get that underway, that process, so that we're not wallowing in our grief or we're not stuck in suspended animation as we anticipate a burial that's at some later date. MCCAMMON: The funeral director says there will be heavy security, and she's expecting an enormous crowd. One of the people who will be there is Marcia Urum Kramer, who knew both Rosenthal brothers since they were children. MARCIA URUM KRAMER: And they were just - just so good, just so good people, always with a smile and caring and I'm going to certainly miss all of them, but Cecil and David have a special place in my heart. MCCAMMON: During his time leading the congregation Tree of Life, Rabbi Chuck Diamond says the two were always there, one of them out front greeting everyone who came to worship. DIAMOND: It's the first thing I would see, and I'd always say, Cecil, you're going to chase everybody away. That's why nobody nobody's here because you're sitting there, you know, and he would have some retort to me, and we would laugh and hug each other. There's no question in my mind he was sitting in the back of the sanctuary of the chapel at the time greeting people. MCCAMMON: Dr. Jerry Rabinowitz, a 66-year-old local physician, will be remembered in a separate funeral today. Services for the rest of the 11 victims are being planned in the coming days. And Jewish leaders here say there will be many months of mourning. Sarah McCammon, NPR News, Pittsburgh. (SOUNDBITE OF HEINZ GOLDBLATT'S "TRAVELING") Transcript provided by NPR, Copyright NPR. Students at Florida International University gathered to light white candles in honor of the lives lost in Pittsburgh after a gunman murdered 11 worshipers gathered in a synagogue for Shabbat services. As each flame was sparked, the names and stories of the fallen were read. Hillel FIU is a student-organization which aims to unite students and faculty through Jewish culture and education. Director Jon Warech invited the community of all faiths to stand together in moments of tragedy. Eleven people were killed on Saturday when a gunman entered Pittsburgh's Tree of Life synagogue and opened fire on the congregants. The victims ranged in age from 54 to 97; eight were men, three were women. Two of them were brothers, and two were a married couple. Chuck Diamond was a rabbi at Tree of Life until about a year ago, and he remains a member of the community, living just around the corner from the synagogue. He knew many of the victims. Federal prosecutors have charged Robert Bowers, the 46-year-old suspected gunman who carried out a mass shooting at a Pittsburgh synagogue Saturday morning, with 29 counts in the deaths of 11 people, The Associated Press reports. "Please know that justice in this case will be swift and it will be severe," Scott Brady, the chief federal prosecutor in western Pennsylvania, said at a news conference, according to the AP, describing the massacre as a "terrible and unspeakable act of hate."